Note: Since I live in Tanzania, I will use the format that ground floor is ground floor, and the floor above ground floor is first floor. Okay? I think Americans do it differently. Update on the First floor. Recall this is sitting on a ring beam and is 6m square. Because the floor is a groined vault on the same ring beam this means the groin corners/springer's start below the floor of the first floor. Here is a detail of the groin. I worried and tried to figure this out for a year. In the end we just started and experimented. We tried all sorts of ways and in the end found the easiest also looks to be the best bond and strongest. (See Left) The brick extending into the groin is cut a complicated angle off the top corner, so that the brick above on other wall follows the same shape. At first we did not over shoot that brick. Later we might cut that extension. The black wedge there? Not sure what to do ? The mortar of mud is very hard, but we might clean it all out and wedge a shaped brick in. This is front the other side, so you see the brick in the corner from the end, and the top right corner has been cut to follow the line of the brick on the right. It is marked for cutting by laying the bricks dry and marking the appropriate lines. We laid all bricks this way up to 1.8 m. I was very suprised we could go this high. We tried putting a 6mm bar between some courses. We could of kept going but we had one corner slip and probably would of needed to shore up the groin. Bigger reason is I think the bricks running parallel to the wall look better than the "Gothic way" of perpendicular. We now run the first course on top of the wall extending 1/3 or 8cm out from the wall and lying down. This gives a slight overhang if some water manages to go this way. It will not stop rain at a slant. Then we place arch rows parallel to the wall on the other bricks. Underneath it looks like this. Once both sides have one course we use strings to keep the shape. The mortar is very thin (3-6mm) and adds no structural value/strength. 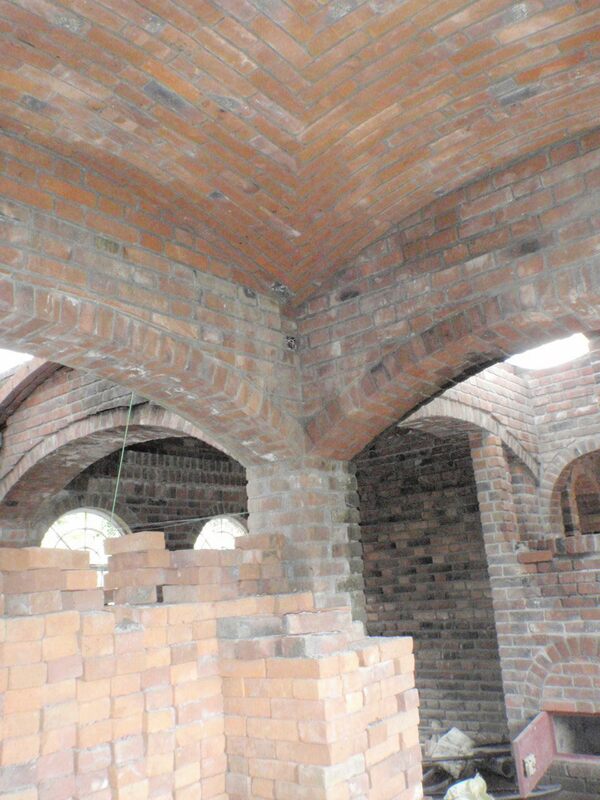 It solely serves to hold the brick until a arch is completed and then is a filler. At the Intrados the two bricks touch and there is no mortar. After a arch is done a wedge shaped rock chip is put in the extrados and each brick is tamped to make sure they have touched at the Intrados . After an arch is completed the Extrados is filled with mortar. Yes the scaffolding is lousy, I need to find money to make real scaffolding. It is already starting to look way cool. I can hardly stop admiring it each day on way to and from work. Incredibly beautiful. We build about 3 -4 arches on a side then other side. Note strings. Pity to later cover this. About a year ago we finished building the first roof/floor on a house near the clay brick factory. This is one of the vaults on the ground floor ceiling.. The guy I taught was Robson and he and i worked it out. But he would often be hard to convince ( ie accept whatever I said) of a particular way. I often would get frustrated that they would not follow masonry principles, like using mortar within 20 minutes etc. A neighbor begged to use him, he went for some weeks and came back. then he said he had a big job in Babati and he went but would come back. He never came back, first he would postpone and eventually he stopped picking the phone. So Makalla found me Dickson. He is slower but in the end I think he will be better. So i had him try a small vault spanning 1.5m to cover a bathroom. So after about a year and all the time worrying about it we started the first floor (2nd to Here ) roof. which is a groined vault starting from the cornors and 6 meters wide. steep. Below is to the the first floor walls. We dont build to the cornor becuase the vaulted roofs will start in the cornors at floor level. TThe gap is the cornor of the room. Below is the shape of an end wall. Looking at the same wall in profile and the second wall. So at this point I kept waiting. and waiting for robson. Depressed me and made me mad. So I started all over again with Mr Dickson. then we figured out how to cut both. so this cornor we tried everythign. probably shoulod of ripped it out. after all the expericments. structurally it is okay. and here below we started cutting them both but having joint in the groin. then the last five courses we did an overlap, just cutting the top off the one being overlapped. it leaves a cavity which we will fill later.